Beside compiling net worth, this template provides more information than just list of assets and liabilities. 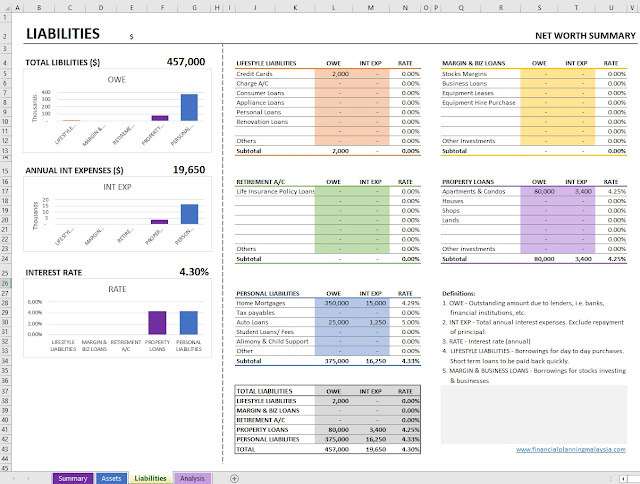 You can download this Net Worth Calculator (Excel Workbook) here. the amount readily available for emergency like accident, job loss, deposit to buy property, etc. From the perspective of financial planning, we need a few things from our portfolio of assets. We need the portfolio to provide passive income to cover our living expenses after our retirement. We need the portfolio to grow in value higher than inflation so that we can continue to live the same lifestyle we want. We need it to be readily available as cash for emergency. while your home will grow in value beating inflation, it is not liquid and it does not generate income. We need to structure our portfolio with proper combination of assets classes and loans, to meet all the needs above. 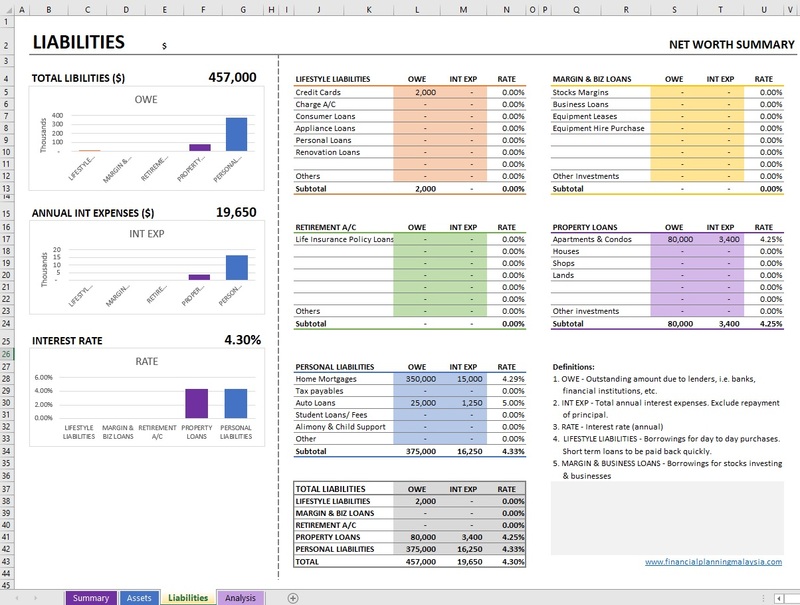 This Net Worth Calculator is meant to provide useful information for you to have a long term view to plan and manage your assets and liabilities. Are your assets generating income lower than that of savings deposits rate? Are your assets value appreciation high enough to beat inflation? Are you keeping too little assets that is readily convertible to cash for emergency like job loss, accident, etc.? What is your return on assets? what is your assets appreciation rate? both information is useful for long term projection of your retirement fund. Enter your list of assets in 5 different categories/ classes. Enter market value, annual income and value appreciation growth rate of each line. Enter your assets value, income and growth rate in the highlighted cells. Enter your list of loans and liabilities in 5 different categories/ classes. Enter the outstanding loan amount and the interest expense for one year. 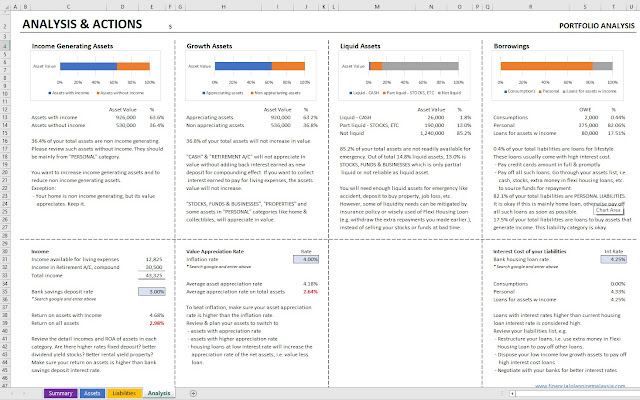 Enter your loan value and interest rates in the highlighted cells. 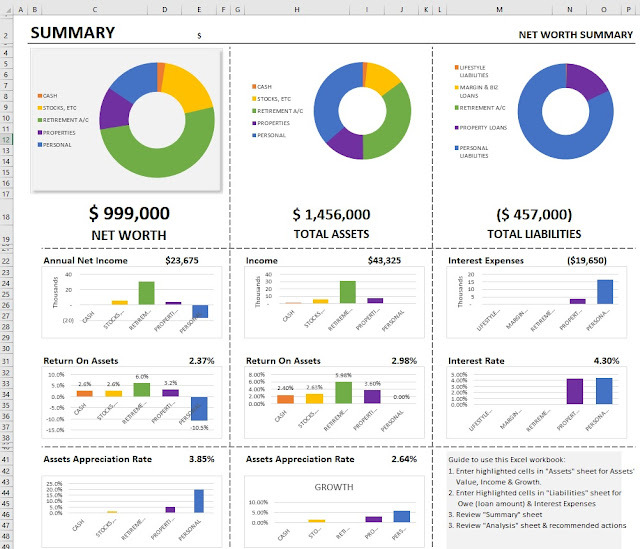 Understand how each category of your assets performed and the cost of your liabilities. purpose for income, growth and liquidity. Can the assets be improved? Can the combination be improved? Review & carefully think through the analysis and actions suggested. 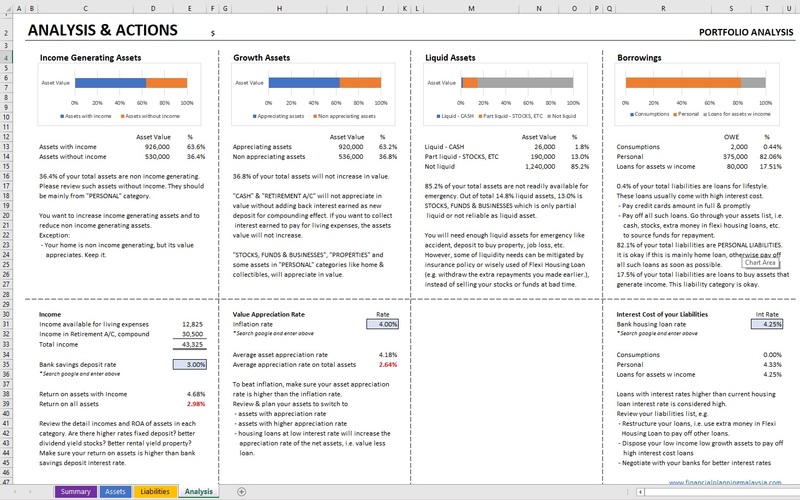 You will learn new perspective of your portfolio by just go through the exercise itself compiling your own net worth. 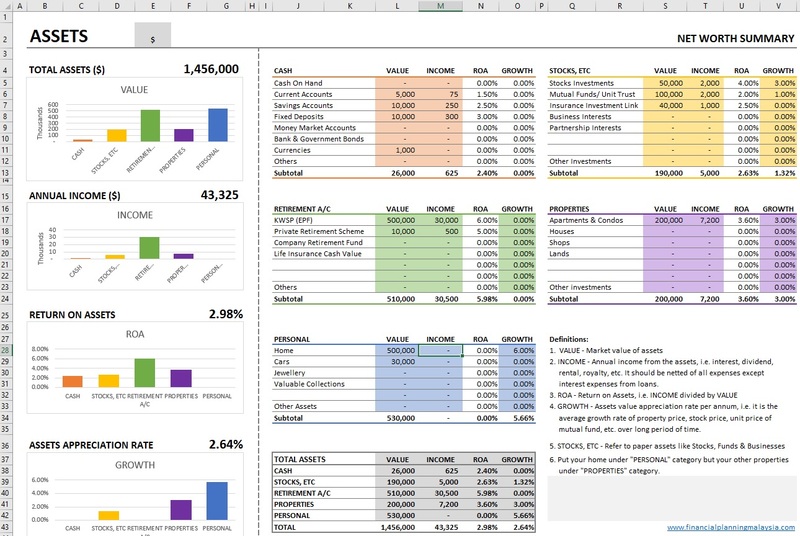 You may download the Net Worth Calculator here or use the Excel online version. I am curious to know whether this workbook is useful to you and how it can be improved. Feel free to leave comments below.